The network infrared illuminator provides covert or semi-covert lighting for medium-range indoor and outdoor surveillance applications. IR illumination dramatically improves night-time imaging, and reduces noise and bit rates. The set of interchangeable diffuser lenses means that beam patterns can be selected that match your application to provide accurately illuminated scenes. The self-cleaning window reduces maintenance requirements. Specifically designed for energy efficient operation, the illuminator can be powered directly from Powerover- Ethernet (PoE+) for faster, flexible, cost effective installations. Energy efficient surface-mount high-power LEDs deliver maximum illumination with reduced power consumption. Advanced electronic control circuitry delivers improved thermal management, long life and low cost of ownership. A pressure equalization valve prevents thermal expansion and pressure cycling. 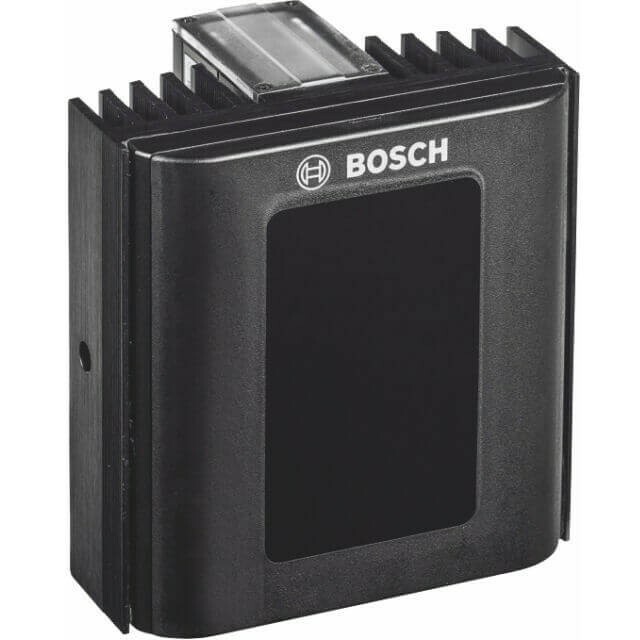 Easy access to power and photo cell adjustment facilitates quick and easy installation. Additional functions include Eco and boot power modes, a tamper/shock sensor, and an integrated web interface for easy set-up and adjustment.